Visit any U.S. LOFT store location or U.S. LOFT online and enjoy shopping during their Friends & Family Event. You can save big! U.S. LOFT is having an amazing event prepared just for you! 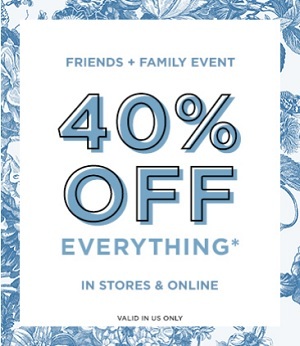 Receive 40% discount on everything. Offer is valid at U.S. LOFT store locations and online. You can get a free shipping on online orders of $125 or more. Source of the information is LOFT. More details available at any U.S. LOFT store location or U.S. LOFT online.